May continued to be bumpy for capital markets. Rising interest rates around the world are causing angst. The stock market in China is in a correction, and the U.S. market is still well below its highs of the year. Meanwhile, President Trump is showing no fear as he places tariffs on friend and foe alike, which is bringing retaliatory actions, and warnings from U.S. manufacturers about unintended consequences. This may or may not prove to be a negotiating tactic by the U.S., but there is a real cost to uncertainty in the stock market. Meanwhile, the U.S. Treasury is borrowing historic amounts at auction to fund President Trump’s tax cuts, and this massive borrowing is continuing to push short-term money market rates higher in the U.S., and also around the world. The yield curve is dangerously close to inverting, which historically has been a strong predictor of recession. Oil prices declined just over 2% in May, but are still up over 10% year to date. Although Russia is not a member of OPEC, their cooperation with Saudi Arabia in curtailing production has been a key driver of oil prices. In addition, political and economic turmoil in Venezuela and Iran has taken more oil production offline. So far, increased production from U.S. shale drillers has not been able to push prices lower. Gold declined just over 1% for the month of May, and is now barely negative for the year 2018. Political uncertainty is often good for gold prices, so its lack of gains for the year is puzzling from that perspective. The likely culprit is the massive gains in short-term money market rates that has occurred globally as the Federal Reserve removes stimulus. As quantitative easing pushed all asset prices higher, it’s removal is also providing headwinds for all asset prices. The dollar rose over 2% in May, and is up 2% year-to-date. Rising money market rates in the U.S. are pulling capital from foreign investments. This is driving many foreign stocks and bonds lower, and driving the dollar higher. The ISM Manufacturing PMI in May was 58.7%, a bit higher than the April reading, and still showing strong economic expansion. The non-manufacturing, or services, index came in at 58.6%, also showing continued strong expansion. The Commerce Department released its third estimate of first quarter growth, showing the economy grew at an annual rate of 2.0%. This was a downward revision from its first estimate, which showed a growth rate of 2.3%. The National Association of Realtors reports that existing-home sales in May were 0.4% lower than in April, and are 3.0% lower than they were a year ago. Lawrence Yun, NAR chief economist, says ‘…there’s no question the combination of higher prices and mortgage rates are pinching the budgets of prospective buyers, and ultimately keeping some from reaching the market.’ President Trump’s deficit spending is good news for some, but as it drives interest rates higher, it is bad news for others. The median home price rose 4.9% to $264,800 from a year ago. Median home prices are now at an all time high, and have been rising for the past 75 months. The average 30-year mortgage rate in April was 4.59%, reflecting 8 straight months of increases, and the highest it has been in 7 years. Distressed sales (foreclosures and short-sales) were 3% of total sales in May. The best way to make money in the stock market is during a stock market crash. If you are continuing to buy stocks with every paycheck, there is nothing better than buying a productive asset at a 20% or 30% or 40% discount. Indeed, patient investors can owe much of their success today to purchases they made in 1987, or 2000-2002, or 2008-2010. Of course, the previous logic only applies to someone who is still working, and is not going to retire for another 10+ years. The opposite is true for someone in retirement, who is actively pulling money from their retirement savings. A 20% correction for a young person is a wealth creating event, a tremendous opportunity. For someone in retirement, it could mean drastic changes in lifestyle, or even the prospect of leaving retirement to return to the workforce. 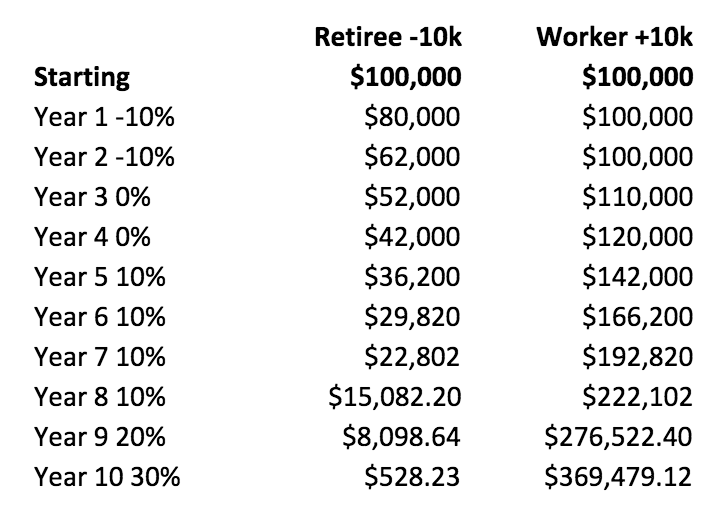 I created this chart to illustrate the difference between a retiree and a worker portfolio – the numbers are exaggerated to make the point – the retiree is spending $10,000 per year, the worker is saving $10,000 per year, they both starting with a $100,000 balance. In year 1, the retiree loses $10,000 as the market declines 10%, and also loses another $10,000 as they spend that amount each year. The worker loses $10,000 to the market decline, but makes up those losses by saving $10,000 of their own money. The 10% spending rate of the retiree is at least double what a prudent rate would be, but the point is that outsized negative portfolio returns early in retirement can be devastating. In this case, despite a stock market with double digit returns in years 5-10, the retiree portfolio basically hits 0 in year 10. With a retirement portfolio, then we become more concerned about the ‘sequence of returns’ rather than the overall rate of return. The overall rate of return in this 10-year period is quite good, almost 7% annualized, so it might be a good portfolio for a worker, but it would still be terrible for a retiree. The point I am trying to make is simple – If you are a retiree, you should make sure your portfolio is not too aggressive as global stimulus is removed, interest rates move higher, and the historically long economic expansion is showing real signs of strain.